In 1891, the Commonwealth of Virginia issued a charter to a new bank, The Bank of Blacksburg. From our humble beginnings doing business from one room of the Green Hotel, National Bank has grown steadily through the years along with the communities we serve. Today, with 25 full service offices and one loan production office across southwest Virginia and over $1 billion in assets, our commitment to friendly, personalized service and local decision making remains the key to our success and our highest priority. Thursday, May 21, 1891 — The Commonwealth of Virginia issued a charter to a new bank, the Bank of Blacksburg. Soon afterward, the bank began to do business from one room of the Green Hotel on Main Street . The first president was Alexander Black and the only employee, W.E. Hubbert, was paid a yearly salary of $500. May 21, 1892 — The Bank of Blacksburg had assets of $21,011.72, reported a profit of $902.27, and declared a 12% dividend to stockholders. 1898 — The bank moved a few doors south on Main Street to the Conway Building and conducted business out of a converted storeroom. 1898 — First telephone installed. 1904 — Purchased first adding machine. 1906 — Installed a burglar alarm system and a vault. National Bank's first banking location. 1921 — Moved to a new building on the northwest corner of Main and Roanoke Streets. 1922 — Re-chartered as a national bank with assets of $485,000. 1942 — The National Bank of Blacksburg built and owned its first office. Seven employees moved across the street to the northeast corner of Main and Roanoke to occupy the new building. 1963 — Moved to the present Main Office on yet another corner of Main and Roanoke Streets. Assets had increased to $8,032,171. 1968 — First branch office built at North Main and Progress Streets. 1974 — Constructed the Hethwood Office. The North Main Office, the first branch built and owned by the bank in 1968. 1984 — A former Exxon station was converted into the South Main Office. 1986 — Formed a one-bank holding company, National Bankshares, Inc.
1988 — The National Bank of Blacksburg added Giles County to its service area. The Pearisburg staff moved from rented quarters to its new office in May 1989. 1990 — Opened the Market Place Office in Christiansburg. 1994 — The bank added a second office in Giles County by converting a First Union office in Pembroke. 1996 — The Bank of Tazewell County (BTC) joins National Bankshares, Inc. BTC operates bank offices in Tazewell, Richlands and Bluefield, Virginia. 1997 — Opened the Rich Creek Office. 1998 — The National Bank of Blacksburg added another market area with the acquisition of a First American office in the City of Galax. 1999 — The bank opens its tenth banking location on the corner of Hubbard and South Main Streets. The Hubbard Street Office location also houses the bank's Bank Card and Trust Departments, Human Resources, and other administrative and executive offices. The new facility serves as the headquarters for The National Bank's holding company, National Bankshares, Inc. The Main Office continues to be located in downtown Blacksburg. 2000 — New offices are acquired in Radford, Pulaski and Dublin , expanding National Bank’s service area throughout the New River Valley . Bank of Tazewell County acquires new offices in Abingdon and Wytheville. Changing the signs in 2006. 2000 — National Bankshares Insurance Services and National Bankshares Investment Services are founded. 2003 — The bank opens a new office in downtown Christiansburg. 2004 — The National Bank of Blacksburg adds its fifteenth location with the acquisition of the Memorial Drive Office in Pulaski, Virginia. 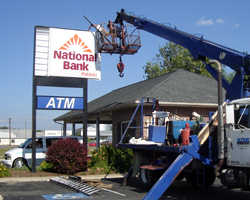 2006 ― The National Bank of Blacksburg and Bank of Tazewell County combine their operations to form National Bank, with 25 banking locations across Southwest Virginia. 2011 ― National Bank grows to over $1 billion in assets. 2015 ― Bank opens its 26th office location in the Virginia Tech Corporate Research Center in Blacksburg.